Over the last few days my brother's family from Kansas was visiting. Tara and I were so very happy that they made the effort to come out. Our kids particularly enjoyed their cousins, as they provide such fun playmates. Together they create such wonderful memories for all of us. Their departure this morning left us to a home town Thanksgiving, after which we'll settle into what we hope will be a long stretch of routine. Henry was very relaxed and happy during their stay. He's feeling so much better. The treatment for his swelling after leaving the hospital recently was simply fluid restriction, but steadily over the last week he has lost the weight that came on so quickly. He's not been allowed to drink more than 16 ounces of fluid daily but has been urinating far more. It's strange to watch. At his heaviest he weighed a little over 60 pounds. He's now down to just below 48. He's looking so much more normal, no longer drawing stares from people when we're out. The puffiness around his eyes has diminished significantly with the help of a wedge we placed under the head of his mattress to keep gravity working for him instead of against. At the same time, we've been slowly reducing his steroids, his appetite has been steady. Tara and I have the distinct feeling - and we don't mind - that he's really enjoying eating again. That's a pleasure we're just not about to deny him. 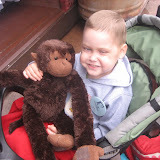 Henry cannot begin his next round of chemotherapy until his platelets begin recovering. We chose this situation to make our first use of Hospice services. Perhaps I'm being unreasonable, but sitting holding Henry, listening to him scream, while an unfamiliar nurse digs for a viable vein in his hand, is just not something I can handle very well. I guess I'm of the mind that his short life should have as little discomfort as possible. So I gave them 60 seconds and then politely asked them to pull it out, realizing that now tomorrow we'll make the trek to Baltimore to have a 45 second procedure. The nurses there are so artful, expert and complete with the way they handle these delicate situations with the kids. It will be familiar, it will be routine and it will take most of the day. But I'd rather keep him comfortable. Recently I've seemed to notice a maturity and calm about Henry. He's very trusting of Tara and I. He no longer fusses much at inconvenience or changes of plan. He's grown to enjoy coloring, painting, and games that before he wouldn't touch. He seems laid back and happy, laughing far more than either Tara or I can remember. This combination is at once, immensely comforting and fulfilling and devastating. We're beginning to see him grow into his next phase of life, a confident, curious, interesting, talented and smart little boy. After years of babying, tantrums, little sleep - then chemotherapy, procedures, radiation and the hospital - we're able to develop a more mature relationship with him. He's polite and articulate. He's a pure pleasure to be around. Sometimes things you say as a parent come back to get you. I'm fond of reminding my children that it's important to be grateful for what they have, instead of worrying about what they don't. This Thanksgiving, I'm content and grateful that we're all here to enjoy one another. We were visited by the third round of Hospice staff today. The amount of assistance available is wonderful. It's surreal, though, watching him laugh and play on the floor while discussing things with Hospice services. Fortunately our current needs from the services offered don't demand much. We count ourselves ever so fortunate that Henry is feeling great. He continues to drop pounds and looks better each day. He is really in the best mood lately, finding everything gut-busting funny and laughing like he can't control himself. It's the absolute best sound in the world. He and the girls sat and played Mario Cart this afternoon for hours. Being good sisters, they let him win each time (well, almost every time...) and finally he stood up, chucked the steering wheel across the floor, threw up his hands and yelled "Yeah Me! ", mimicking Anna's phony narcissism, "I won every time!" He joked and played and teased all evening, chuckling the entire time. When it came time for bed, it was clear he was tired, but had enjoyed the day so much he didn't want it to end either. It was really a magical afternoon and evening. It was cold, but we had a fire, candles, wine, good music and family all about, and again, the laughter was golden. While we haven't fully settled into a rhythm again after the hospital, we're on our way. Henry is handling his fluid restriction in stride, the limiting of his juice being the only effective solution for the additional water weight he's carrying right now. Yesterday he was down a couple of pounds and we're hopeful that the morning weigh-in will reveal the same. He's limited to just two cups of juice a day, hoping that his body will look to the additional water in his cells as a source instead. The chemotherapy he took at the beginning of his relapse treatment, Temodar, is scheduled for it's second round, but after getting his blood checked today, the doctors have suggested waiting a week to see if his platelets will begin coming up on their own as they're a bit low. Today's visit was routine, an early trip into Baltimore, visiting in the playroom with old friends and new, and playing with favorite toys. The Big Event for Henry now that his chest catheter has been removed, is the blood draw. They have to stick his pudgy, water-filled arm and dig for a vein. Even the skilled nurses look to the experts in this case, and a hand tap was chosen this time. While painful to him (crying actually pumps the blood out faster!) it was skillfully and mercifully on target the first stick. Thank goodness for the experts! After our visit, Henry and I took his accompanying Grandparents to visit St. Casimir, our second home during radiation and post-transplant. His memory is incredible. We recalled the water taxi, the outdoor courtyard, the roof of the building, the elevator, the shops - it was a very pleasant experience in the end. This reminiscing brought to mind a recent conversation with our primary oncologist when first discussing Henry's relapse. "I guess this is the part of your job that makes you wonder why you went into this field," I asked after discussing our palliative care options and how things may evolve in Henry's coming weeks. His reply was clearly one he'd considered heavily before. "Really, its the people in this situation that we find we're able to help the most." And it's the truth. Good doctors, good nurses and a good hospital and staff have made all the difference in our journey to date. The fact that Henry can look back on months of treatment and want to go back, reflects the miracle of their care. Just a quick update to let everyone know that we are home and happy. Henry is working on his overall sleep deficit, and his swelling is better today than yesterday. There's a long way to go and we aren't sure that we are out of the woods, but hey, at least we're out of the hospital! A quick update from Tara: Bryan is down in the hospital with Henry tonight. Overall, he had a good day. We're were seen by a number of physicians, and no one seems to have a firm grasp on what's going on. Which is ok. The goals of this admission were twofold: to make sure that we weren't missing something major, and to get the swelling to go down. I'm pleased to report that we have progress on both fronts. Essentially all of the testing done has been normal, with the exception of the low protein and electrolyte abnormalities that we already know about. This is great news. Even better, Henry's swelling seemed to respond to some of the IV medicine that he got in the hospital, and though he's still quite swollen, we appear to be headed in the right direction. There's a little more testing scheduled for tomorrow (which I expect to be normal.) We hope to be discharged after that, with close followup this week with the oncology clinic. The best news of all is that Henry remains in great spirits. He chatted me up the whole way to the hospital last night. He went on and on about all of the fun things about the hospital (the food, the nurses, the toys), and I think he was actually looking forward to being there for a little while. It's amazing that he's put aside all of those bad memories, but has been able to hold on to the good ones. What a trooper! Henry and Tara are resting in their own room on the oncology floor after a long night in the ER. Tara said that Henry was a delight, offering the nurses his Hershey's Kisses. He'll continue to get tests and medicines to help diagnose and reduce his swelling. For now, they are comforted to be in a familiar, albeit medical, setting, attended to by the staff we've grown to trust. I'm heading down to relieve Tara after leaving the girls with their grandmother. Hopefully we'll get to the root of the issue soon. Tara and Henry just left for the Hopkins Emergency Room tonight as after a couple hours of rest, Henry began coughing. This concerned Tara and I enough to decide that we didn't want to wait until the morning. I'm staying at home with the girls until the morning then meeting them down in Baltimore. True to form, I told Henry and he was his little trusting self. He gave me a thumbs up as they were leaving. We've been focused on Henry's facial swelling of late. He's not been able to see out of his right eye for days and now his left is beginning to swell. At the rate it's going it will also be shut tomorrow. We've contacted the doctors and are awaiting word, but we expect to drive to Baltimore today for admission. The alternatives of nutrition modification or other medicines are too slow and we're fearful that waking up tomorrow and not being able to see will really scare Henry. A redeeming factor is that he's been in a terrific mood, very agreeable, however a bit moody. He enjoyed a visit from a family friend yesterday, we built a birdhouse and painted it and went to see Madagascar 2 with the girls and Tara yesterday evening. **Update** We've started applying pressure to his eyes with some good results, which may buy us a couple more days before we need to treat him more aggressively. Henry's swelling issue, has not yet subsided. We moved our clinic visit forward to today and made the trip to Baltimore. It was a pretty run of the mill day for Henry at clinic, however we did have an extended conversation with the doctor about the possible causes of Henry's swelling. His right eye continues to be completely swollen shut despite some attempts to correct. Blood and urine were taken today to run some tests. Later this afternoon we received a call saying that some of his levels are off a bit. There is no definitive cause as yet, but we've been recommended to increase his protein intake and make a nominal attempt at reducing his sodium. So we're focused on eggs and chicken nuggets for tomorrow and we'll try to reduce the chips. There are several other avenues to check out so we'll await further opinion. For now, while it's nothing urgent, he's at least comfortable. He's not complained at all. Our second day in Disney we spent at their Hollywood Studios. We played the Toy Story Mania shooting game, met some very special friends, enjoyed Playhouse Disney and ended the evening with some fun back at the village. We can't forget the exciting stunt car display too! Loud but a huge highlight! 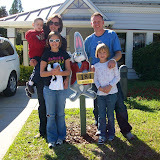 We started out the day visiting with Mickey and Minnie as well as several other friends from Disney. The time change kind of threw us off - so we tooled around the village, played in the pool, made pillows, played on the carousel and then split up in the afternoon. The girls and Tara went to explore Sea World, while Henry and I rested and eventually joined them for a showing of Shamu. Since his diagnosis, over a year, Henry has been the same weight - 20 days on steroids, he's gained over 15 pounds. The change has been extreme. You can see from the pictures here, taken only days apart what it's come to. This image was a few days after our return from Florida. Making cookies with Mommy. This one taken just today. The water retention swells his face and makes it so he can't see out of his right eye - he sleeps on that side most often. In the picture Henry is painting a 'project'. One of our favorite activities is putting together little wooden models from the craft store. He loves to spend time painting them. He has no patience for crayons, coloring or markers. But the boy loves to paint these things. He'll spend an hour painting and making sure he covers every bit of visible wood, sometimes with several colors. I just love watching the concentration when he does it. Sometimes you can catch him whispering to himself, "glob", meaning he's got a bunch of paint to spread around. After a long Halloween night, we decided to take it easy and to take advantage of the wonderful resort which is Give Kids the World. We attempted a visit to Universal Studios, which was unfortunately closed for their last Halloween bash. This turn of events let us spend the evening relaxing at the village. 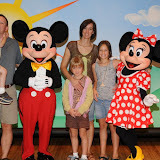 Our first full day at Disney included a busy morning at the Magic Kingdom. 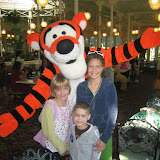 Breakfast at the Crystal Palace with Tigger, Pooh and Piglet, then off to some rides. In the afternoon - a rest and back to full tilt for makeovers and the Halloween Party, complete with a parade and fireworks. Lots and lots of pictures...it's taking a while to get them all into one place and organized. Here's the first batch - just a general smattering of the resort we stayed at which was ever so amazing. A good trip home and looking forward to sleeping under our own roof. I'm hoping to get some of our better pictures up tomorrow. G'nite all. On the road and we're eating Chick-Fil-a. The driver said he's never stopped there before. I had to stop the drive thru line to get the photo - enjoy it! While getting food with the girls, Tara was in charge of getting 'Nemo' playing in the limo. Henry's advice? "Push the power button Mommy. The power button always helps." Waiting for bags after an uneventful flight. Spent the morning packing and checking out. As seems typical here some special things were afoot.....but we have to keep some things for a surprise - more pictures in the coming days! We have 5:30 flight, leaving just a couple of hours of shopping before we head back to the airport and limo ride home. We arrived back at our villa to find gifts again - another stack of movies and a photo album. Henry went down easily and we talked, laughed and cried a little over dinner. I took the kids for one last ice cream treat tonight and now we're off to bed. Leaving Epcot now for GKTW, our final departure from Disney. We will forever hold our time here close to our hearts. Up for a fast ride? We're on the verge of entry to Disney's fastest and longest ride! Yikes! We grabbed some lunch near the Himalayas. Henry is enjoying some ice cream and then I think we'l try to catch 'The Lion King'. After an amazing productuin of Nemo, it's time for a big ride then lunch! Taking it all in...we're seated to see Nemo now. We walked right in with no wait. The privelage that Wish Kids get is really humbling. That's the bestest animal I saw! - Henry about the Silverback Gorilla - and then "Let's get the scheck outta here...."
We're headed to the animal kingdom today. Everyone is well rested and ecited for the day. Back at GKTW, we met a visiting sloth from Discovery Cove at Sea World. Henry had a great afternoon, perhaps the best of the trip. The girls enjoyed an entertaining evening at a games night called 'Safari Double Dare'. A very good day in the end. The stunt show was fantastic and although loud, enjoyed by all. Mommy, why do all the trash cans tell us to waste? Ready for the Stunt Show! We started with 'Toy Story Mania' which everyone really enjoyed, shooting things inside the Toy Story motif. Playhouse Disney was the highlight so far for Henry - seeing Mickey, Handy Manny and Pooh. 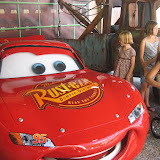 We met lightning McQueen and Tow Mater for a photo op too! Now we're on our way to a see The Little Mermaid! Rested, fed and happy and on our way to Disney's Hollywood Studios! We started out slowly today, meeting Mickey and Minnie and some other friends who came to the village. We ate and walked around, exploring for Henry's benefit. We made special pillows in the Castle of Miracles. Henry's now napping, recovering from the time chane and long days. The girls are having the time of their lives, now enjoying a dip in the pool. We're hoping to get to MGM today to meet a few characters, but keeping our options open. Candyland, Peppermint Swirl (which involved wrapping Daddy in red and white crepe paper) and libo! 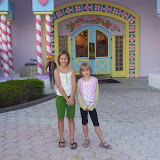 Candyland at this place is larger than life. Lifesize board, loud techno-teen music and all the candyland characters - an experience not easily forgotten. Henry really needed to rest for a while. All that he really want thos afternoon was to sit quietly and watch tv. We dropped Mom and the girls at Sea World for the afternoon and we're resting at the village. After three days he finally asked for ice cream! Worth being back at the village! Henry missed meeting George, he's falling asleep as I write - the first stroller nap. Our day at Universal has been pretty entertaining but a little stressful as it's oriented more for the girls and Henry's ready for sleep. Henry's feeling good so we're off to see Curios George! In case anyone reading is unaware, the time changed today. We were unaware, and therefore an hour too early to breakfast, which was closed. So we're off to plan B, breakfast elsewhere, and then to try at Universal again! We're getting an early start at Universal today. Henry slept great last night after we attended the village mayor's birthday party. Into every great vacation a little rain must fall. After a good nap, we headed to Universal Studios for a quick visit. The rain ended just as we arrived, but the visit was not meant to be. The park was closing for a special event just as we arrived. So we decided to drown our sorrows at Margaritaville (the kids in chicken nuggets, us with the rocks and salt). 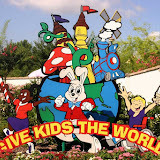 We're heading back to GKTW for a party. We've just decided to have a day of R & R around the village. Trains, some fishing, putt putt, and a very cool playground. We got a complaint that Henry wasn't smiling enough in the pictures. Last nite we really pushed him so the girls could see the Halloween festivities at Disney, and he was pretty tuckered out. But he and the Mayor are officially bright-eyed and bushy-tailed this morning! !